The tutorial to communicate via MIDI can be found here. Bus Pirate v3.6a doesn't support JTAG out of the box, despite listing it as a supported protocol. You'll have to update the firmware yourself, and figuring out which version to get and how to update the device is a real pain as documentation, releases, and notes are scattered across many sites and wikis. Additionally, once you do locate a more recent firmware build, you'll discover that the JTAG support was limited to a terminal before being removed entirely. OpenOCD binary JTAG protocol support does exist on the most recent firmware versions which are too big for Bus Pirate v3.x hardware and can thus only run on the Bus Pirate v4 or later. BEWARE: The version that says "2/10/2010" on the bottom has the wire colors backwards from what the firmware tells you they are. You can pull the plastic shroud off and re-install it backwards to correct the error. Don't forget to grab the cable, I didn't realise it wasn't included. 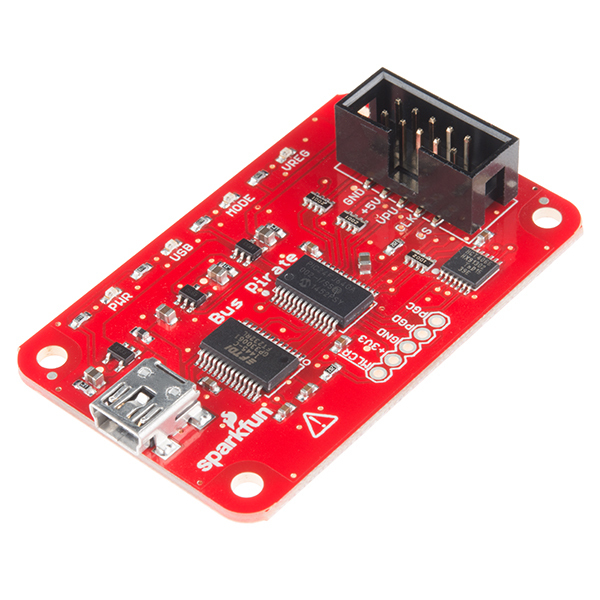 Does it handle multi master for I2C? What "kind" of serial device does this show up as / is there a particular driver (for Mac OS X, specifically) required? Sorry about that oversight. 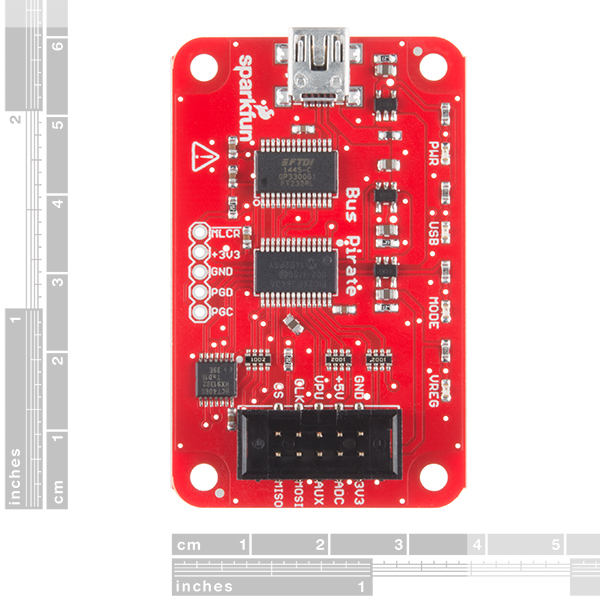 It has an FTDI USB to UART bridge, so you need the standard FTDI drivers for a Mac. The drivers that come with OS X work, but are flakey. Will this work for communication between a PC and a peripheral that is only 1.8V tolerant on its GPIO and I2C pins? Not really. I2C is open-drain, so you could hook 1.8V to VPU. You would have to modify the main processor on the Bus Pirate to run at 2.0V for it to register 1.8V as a login level high. SPI is push-pull, so as designed this will drive at 3.3V. In general I'd say this is only for use with 3.3V or 5V parts unless you use an external level shifter. Thanks for the reply. Reason I ask is more and more sensors and AFEs are running at 1.8V native and I'm tired of setting up level shifters! Is there any difference to the Dangerous Prototypes Bus Pirate v3.6? Looks just the same. does the mean that your version of this HW conforms to the DP6037 board outline? the image with the rulers suggests that it does not. the pervasive literature out about this suggests that it does. They are the standard 60mm x 37mm that is the DP6037 outline. I verified that in the EAGLE files and with an actual board. We will look into why that image shows them being so much larger. I bought a bus pirate over a year ago, and when I finally got it out to play with, it didn't work and failed the self test. Spark fun sent me a replacement 14mo later, free of charge, no questions asked. 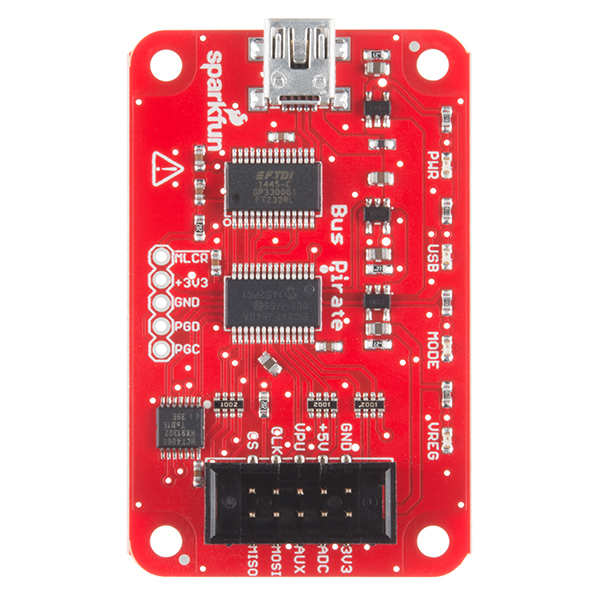 The bus pirate is very handy, and spark fun is worth buying from. Needed to develop a 9 bit serial library for DotNet and Arduino. Bus Pirate was the perfect tool for the job. Easy to setup, worked perfectly with the OLS logic analyzer software. No glitches or workarounds needed. All for thirty dollars. I needed to have a quick and easy means of testing an I2C interface for a work related project. I came across the Bus Pirate so ordered one. Simple to set up with the help of the tutorials and had it up and running in the lab in no time. I've not tried the other interfaces as yet, but I've been extremely pleased with what I needed it for. I was able to get a couple of I2C peripherals figured out in an afternoon. It's great to be able to play around without having to write a line of code. I'm almost didn't buy one but I'm sure glad I did. Used the Bus Pirate to test UART. It only took a few minutes to set up this tool and confirm that UART was working. I look forward to using this tool to test my future projects. Amazing product overall! This is a nice little board. It came right up when I got it and I think I'll use it. On the pro side, There appears to be a large number of python scripts for working with various parts. The rest of the documentation is voluminous. There are a few issues that I have with it, however. The first issue is that it will only work when plugged into a USB port on my laptop. This could be my issue in the form of my lack of knowledge about USB but I do have other devices that just work on my hub. If every device needs to plug into the PC instead of a hub, there are not enough USB ports to do everything that I'd like to do at the same time. It comes up with the red led light by the USB labeled LED on the bus pirate when plugged into a hub. It also won't come up with Terra Term without getting in and seeing what serial port it connected with. Another issue is that most of the parts with which it would communicate are surface mount devices. That makes it hard to use it with those devices without making a board for them or wiring them up which would be a complex and intricate task. The manual isn't perfect either. For example, after a mode is entered, how does one exit that mode? While, I just figured that out, it isn't clear from the help menu & I had to spend time that I probably shouldn't have to get it to work. Regardless, it appears like a tool that I will be glad to have in my tool box once I've played around with it for a bit.. Either I am the dumbest person in the world or this thing is the worst purchase ever! I followed the hookup guide to the letter and the functionality is so basic. For example, I was able to wire up a MCP23017 and enter I2C mode. From there I turn on power (W) then turned on pullups (P). Okay great right? So I scanned for addresses and found 0X40. I issued some bits needed to turn GPIO to outputs then turned on some LEDs. No problem so far. Then I head over to Dangerous Prototypes, this documentation is so outdated and no longer is supported. His videos are from along time ago even. I downloaded OLS to my mac and struggled to make it even open. Okay now what? So I watched some old youtube (the only ones out there) and tried to see if I can even get some data to capture. Yeah RIGHT!!!! This thing is so epicly not worth your money! It wouldn't even read an I2C stream from the Particle Photon. Ultimately, I wish I would have saved myself a lot of anger and frustration. Now to save nearly $200 for a better product. Ok, so not really "hacking", but the bus pirate saved my laptop after a bad BIOS flash. I have an old ThinkPad T60 that I was experimenting with Coreboot/LIbreboot on. One of the ROMs I flashed to the laptop had a problem and the machine failed to boot! Using the bus pirate (which I was able to upgrade to firmware 6.2 beta to get faster SPI speeds), I was able to reflash the BIOS chip directly! This is the second one Iâve bought. The first never worked. I needed to get a SPI interface going so I just bought another one. It worked as advertised and was quite useful. Iâve only used it for SPI as master. It did that well. I used the Terminal interface with TeraTerm. The only issue I had was that I expected the CS to change with the sending of data. It is completely manual. SF tech cleared me up on that one. Docs for that need some clarity. Great value.